In a communiqué published on November 17, the date of its 35th anniversary, the Zapatista Army of National Liberation (EZLN in its Spanish acronym) invited people to two events to be held at the end of the year: from December 26th to 30th, to a “Meeting of Resistance and Rebellion Networks, of Support for the CIG (Indigenous Council of Government), or Whatever they Are Called” to be carried out in the “Traces of Memory. Subcomandante Insurgente Pedro Did his Duty” center,” in the vicinity of the town of Guadalupe Tepeyac, MAREZ San Pedro de Michoacan. Also, on December 31st, 2018 and January 1st, 2019, the celebration of the 25th anniversary of the armed uprising will be held in Zapatista La Realidad, location of the caracol “Madre de los caracoles del mar de nuestro sueños”, in the Border Jungle zone. The email for registration to the first event is redesdic18@enlacezapatista.org.mx; and for the second anniversary25@enlacezapatista.org.mx. 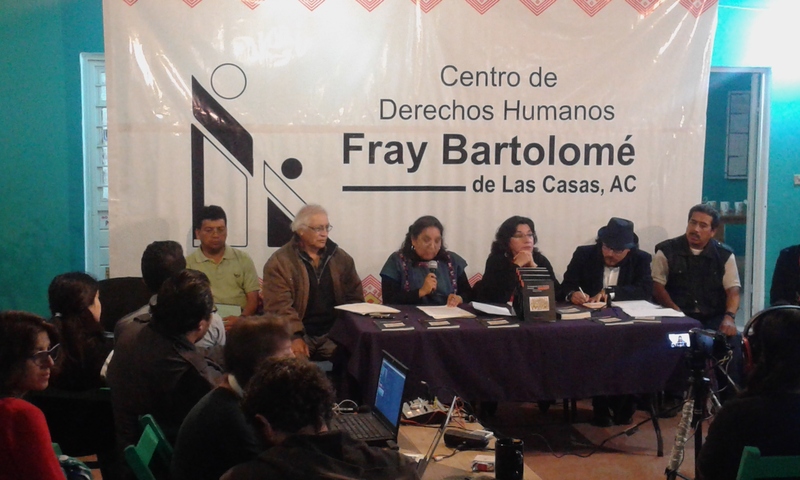 The UNO Special Rapporteur on the Situation of Human Rights Defenders, Michael Frost, came to Mexico on an unofficial visit, stopping in Puebla, Chihuahua and Mexico City. During his stay he held meetings with a number of social organizations about threats and aggressions against defenders, the regulatory framework that encourages criminalization, the challenges of protection, the discrediting of the government by international mechanisms and recommendations, the defense of land and territory, and the situation of reporters. On March 18 last, Nestora Salgado, commander of the Olinala Community Police, Guerrero, member of the Regional Coordinator of Communitty Authorities (CRAC in its Spanish acronym), was released after two years and eight months in prison. On leaving prison, Nestora called on the Government of Guerrero to release the nine members of CRAC who are still prisoners and assured that she would begin a campaign “for the freedom” of her compañeros. For April 10, International Day of Political Prisoners, she called for actions within the framework of the national campaign “Put a Face and Name on the Political Prisoners in Mexico”, to give visibility to the situation of prisoners and demand their release. She stated that, “We are missing 500 political prisoners and I’m going to fight to get them out. I am going to get the release of my compañeros. I will go wherever I have to because I am with you in your struggle and in all the struggles of the people. Nestora added that only together will the citizens be able to achieve change, justice and the freedom of their compañeros and of those in the rest of the country. She intends to travel to other countries to “exhume what has been buried and give voice to the silenced.” According to El Sur newspaper, social organizations also denounced “the grave crisis of human rights in Mexico and the criminalization of those who defend territory, education, land, water, the air and life. For this reason they have called [on people] to join Salgado’s movement and international tour. “We are aware that Mexico is suffering the most ruthless attack by the interests of foreign capital. Currently the territories of indigenous peoples are pillaged and (their inhabitants) are being displaced from their lands through the violence of paramilitary groups, by organized crime, or the territory is being militarized by soldiers and the state police” as is outlined on the call. It is worth noting that the social leader returned to her home in Seattle, USA. In Washington she visited the International Clinic of Human Rights of the Faculty of Law of Washington University, where she started the campaign. The clinic played an important role in the struggle for the Nestora’s release. During her stay in the US, the commander from Olinala plans to visit Los Angeles, New York, Chicago and Washington. She intends to return to Guerrero soon as she is the representative of the Community Police and due to her post in CRAC. “It is once again made clear that truth and justice will never, ever come from above. From above the only thing we can expect is pretense, deceit, impunity, and cynicism. 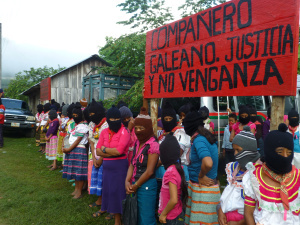 The Zapatista Army for National Liberation (EZLN) denounced in a communique signed by Subcomandante Insurgente Moisés y Galeano (previously Marcos) on August 18th that the two people accused of the murder of the Zapatista teacher Galeano were freed. Galeano, José Luis Solís López, was murdered on May 2, 2014 en La Realidad, municipality of Las Margaritas, Chiapas. You are currently browsing the archives for the La Realidad category.